We have some of the best winter fishing in the southeast. Along with all the general fishing waters found on the lakes in the area and the tail race sections of rivers like the Nantahala River, there are also hundreds of miles of National Park waters to choose from. Add to that all of the Delayed Harvest streams that have been stocked with trout for quality winter fishing and you will run out of time long before you run out of quality places to fish. 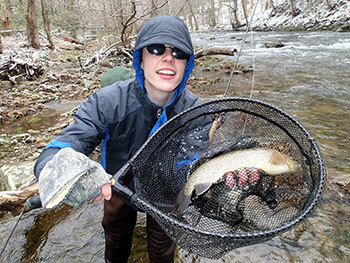 Streams like the Upper Nantahala River, Tuckaseege River through Bryson City, Snowbird Creek and Fires Creek just to name a few are stocked in early October and in the beginning of November for winter fishing. The avid angler can find everything from wade fishing to guided float trips. These streams fish incredibly well all winter long. Try worm patterns, a variety of nymphs including hares ear nymphs, zebra midges, Y2K and other egg patterns. Don't forget your dry fly box: blue wing olives, October caddis and gray and white midges will almost always work on the surface in the winter. swinging girdle bugs and woolly buggers in black, olive and white might get you a big brown or brook trout. Remember Delayed Harvest streams are designated catch and release only, single hook artificial. Crimp the barbs on your fly to make it easier to release fish. 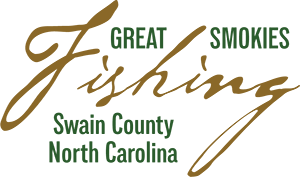 Now is the time to make plans to come to one of the most beautiful winter trout fishing destinations in the southeast United States. The fish are waiting for you! National Park waters like the Oconaluftee, Deep Creek, and Noland Creek, just to name a few, will fish well through the winter. Remember all the streams inside the National Park are single hook artificial. No brook trout may be taken. Winter is a time when it can be harder to find small mouth bass in rivers like the little Tennessee, but they are there. You have to go deep with streamers or bait fish imitations and worm imitations. Use the same technique in our area lakes. Fish the mouth of the tributary streams and you might find a large brown trout heading upstream to spawn. Be sure to only take pictures and release these fish carefully; they are our good breeding stock.